Sambar is something that used to be very rare at my parents place and it's still the same in our house too and the classic drumstick sambar is what I make most of the time if sambar is on menu. Steamed rice, hot sambar, some ghee along itself is great comfort food for me, add a potato fry and some papad on side and it's becomes a grand affair to me. 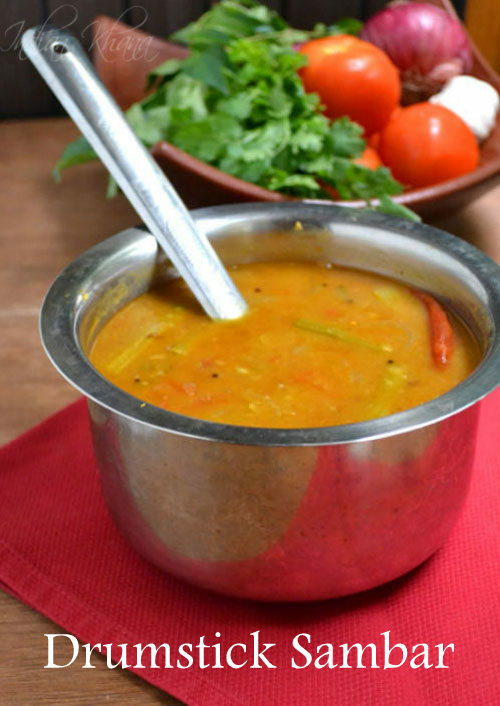 Sambar is one versatile recipe we can use any vegetable or combination of vegetables of our choice and following the same basic recipe. 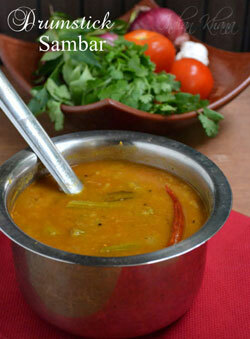 Other popular vegetables used in sambar are brinjal (eggplant), raddish, okra, potato etc. 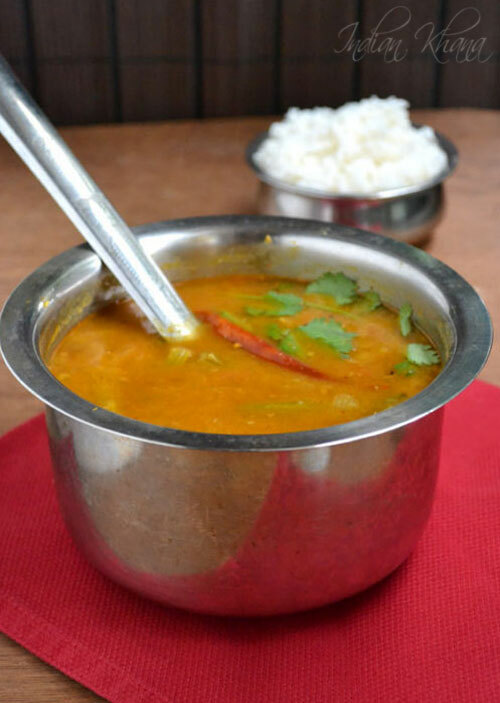 I learnt to make sambar from my sister and this recipe is loosely inspired from her recipe though her version has slight variations and that makes a fabulous sambar too. 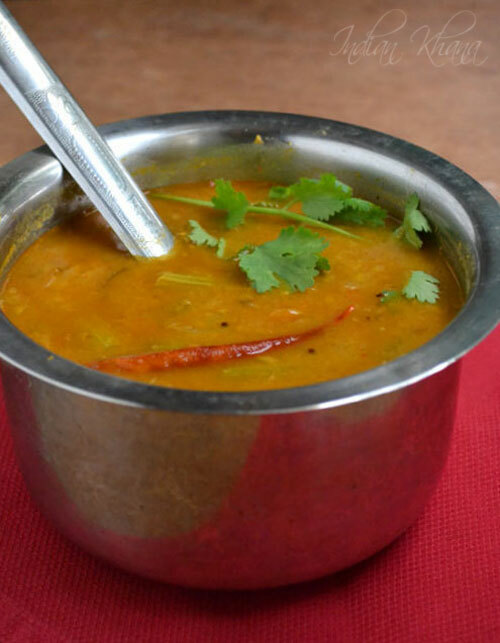 In my in-laws place drumstick dal is made which is very similar to sambar just minus the tamarind and other typical tempering ingredients, a recipe again which I want to share with you all but it's just not happening. If you don't each much of tamarind then reduce the quantity and just add 1/2 cup of thin tamarind water to get the flavor and enjoy the sambar; this is for the North Indian whom doesn't like tamarind, so don't be surprise why am saying this. In my house lot of people doesn't eat tamarind from my dad to in-laws to DH ! Some people add garlic while tempering sambar you can do that too, I add garlic some times for a change and it does add good flavor to sambar though it's generally not added. 1. Wash and soak dal for 10-15 minutes, this is optional step. Pressure cook dal with turmeric powder and water covering dal to 3-4 whistles, once pressure released mash dal and keep aside. 2. Meanwhile soak tamarind in 1 cup of water for 10-15 minutes and extra juice, keep aside. 3. Peel and cut drumstick in 1 inch long pieces, slice onion, slit green chilli, chop tomato and coriander leaves. 4. In a pan or wok heat add hing, mustard seeds and allow to splutter. Add dried red chilies, curry leaves and saute for 30 seconds or until chili gets light brown. 5. Add sliced onion, green chili and saute until onion becomes soft. Add tomatoes and saute until it starts to become soft around 2 minutes. 6. Add drumstick pieces and saute for 2-3 minutes, add 1 cup water cover and cook for 4-5 minutes or until drumstick gets almost cooked. 7. Now add tamarind extract bring it to boil, now add sambar powder and mix quickly to avoid sambar powder from forming lumps. 8. Add mashed dal and stir well to combine everything, add salt and more water depends on the consistency you like (sambar should not be every thin or very thick) simmer for 10-12 minutes. 9. Garnish with coriander leaves and off flame. Serve along steamed rice, a dollop of ghee if preferred along with some papad/fryums and potato fry/plantain fry and enjoy your meal.